From graduation caps for formal ceremonies to funny novelty headgear, there are many types of graduation hats to emphasize a teen's accomplishment in graduating from high school. Academic regalia - or graduation cap and gown - is required for most high school graduation ceremonies. The use of academic regalia today is based on the traditions of graduating ceremonies of Oxford and Cambridge, two of Britain's oldest Universities. Today, the use of academic dress has been standardized by the American Council of Education in the Academic Costume Code and Academic Ceremony Guide. Although it is different for each school, typically a representative from the cap and gown retailer (such as Herff Jones or Jostens Graduation Supply) will come to the high school campus one day during the spring semester. At this time students place their cap and gown order. The school and representative will specify what type of caps and gowns are to be purchased for students to ensure a uniform look for the ceremony. Students or their parents are may required to pay for both the cap and gown that is to be worn during the ceremony, or gowns may be rented and students just need to purchase their individual caps. Your school may choose to have students' graduation dress reflect the school colors, or simply black or white regalia. 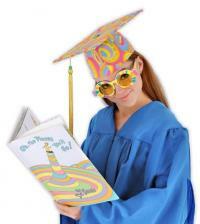 Novelty caps or funny graduation hats are a fun way seniors and new graduates can celebrate their graduation. Students may choose to wear these at senior or graduation parties or other fun events. These types of hats may also be permitted at some types of school functions, such as senior pep rallies, but be sure to check with someone at your school before wearing on campus. Buy Costumes sells a colorful, wacky Dr. Seuss graduation hat (based on the book ''Oh the Places You'll Go'' by Dr. Seuss) and a white cotton autograph grad cap. Web Hats sells a mini grad cap and a plush grad hat for fun and laughs. Although it can be tempting to wear a prank hat to graduation, students should think twice before doing so. Hours of work and preparation have gone into making sure the formal ceremonies go well - and wearing a prank hat can be disconcerting to the audience and can be seen disrespectful to other students. There are hundreds of ways to create funny, personalized graduation head gear, but this is best reserved for graduation parties and other celebrations. Novelties and favors featuring hats are also a big hit for graduation. Having hat-themed items of things like keychains, small plush animals, pens or pencils, bubbles, and even wrapped candies featuring grad hats or caps can be a fun way to combine party décor and favor items for friends and guests. You can also add a hat themed to the event by using a hat-themed cake, serving grad hat cookies, or creating other food items in the shape of or decorated with the caps.